The CherryBerry frozen yogurt franchise location in Sand Springs, Oklahoma has closed. CherryBerry Sand Springs is just one of a number of CherryBerry franchise locations that have succumbed to what seems like a froyo franchise meltdown. The CherryBerry in Sand Springs, OK stayed open for nearly 24 months, longer than other recently closed CherryBerry locations that averaged about 16 months. 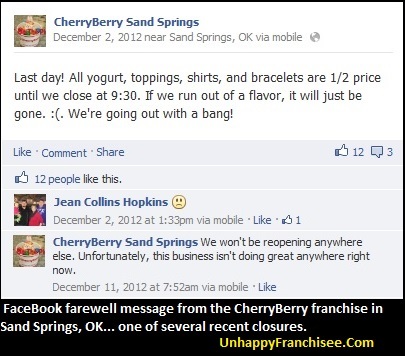 The Sand Springs CherryBerry was owned and operated by franchisees Darin & Pam Shipley. UnhappyFranchisee.Com sends the Shipley family and staff our condolences on the closing of their franchise, and wishes them the best of luck with all future endeavors.